I have been involved with SCDA Edinburgh District since 2010. I was invited to take photos of dress rehearsals. Those days are now past, I know get invited to take shots during the actual performance. Mind you it took some time for the actors to get used to this – they kept expecting to see flash and hear the camera shutter click. I started off bu using a Canon 5DmkII fitted with the a Canon L 2.8 70 – 200 zoom along with a Nikon D700 fitted with a Sigma f.28 70-200 zoom. After the Nikon went to the camera scrapyard I used a Pentax K5-Ii with Sigma f2.8 70-200 zoom. I now use a Pentax K-1 with said Sigma lens. 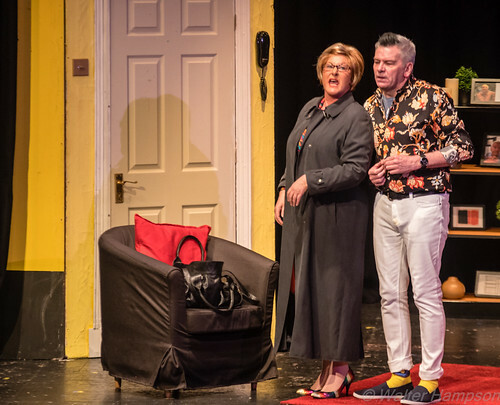 This year’s Edinburgh District round had some challenging lighting in the plays – however before I start on that I better explain about the SCDA 1-Act Festival. 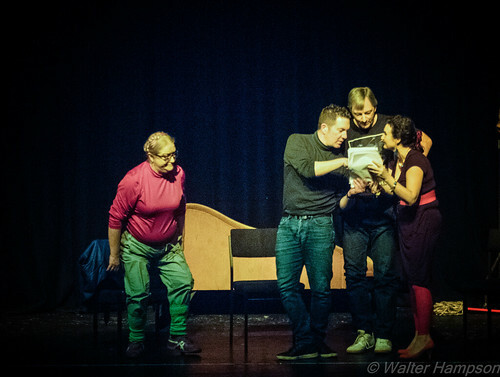 SCDA – Scottish Community Drama Association (also known as Scottish Community Drama) have been running this festival for 86 years (there was a break during the 2nd WW years) Scotland is divided into four division which are further divided into Districts. Each District holds a 1-Act Festival and (usually) the First and Runners up progress to the Divisional Final and in turn two from Division progress to the Scottish Final. The adventure does not stop there as SCDA is part of a UK Festival the winning team from Scotland compete with teams from England, Northern Ireland and Wales to win the British Final hosted in rotation by Scotland, England, Northern Ireland and Wales. Plays must run between a minimum of 20 and a maximum of 55 Minutes (Scotland). Back to this years Festival. 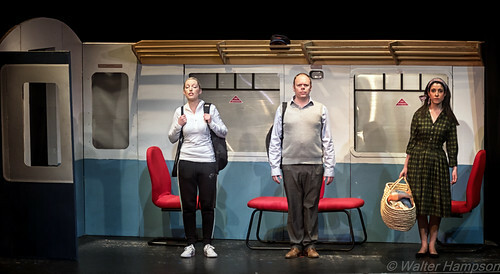 Edinburgh open the season (so to speak ) with their round at Church Hill Theatre on the 15th February. Nine plays from six clubs (Three clubs had two teams) Three teams would progress to Eastern Division Round. Categories: 1-Act, Photography, SCDA, Stage Shots | Tags: 1-Act, AmDrama. Stage, Church Hill Theatre Edinburgh, Cowan Centre, Eastern Division, Edinburgh District, Fife District, Pictures by Walter, Susan Wales, Walter Hampson | Permalink. The time had come for the four champions to meet for the title of British 1-Act Champions. Four clubs would fight it out to be crowned the British Champions. These teams had survived from District > Divisional>Country and now going head to head at the MAC (Metropolitan Arts Centre) Theatre, Belfast. The festival would be over two days and Walker Ewart, a well respected Adjudicator would be landed with the task of picking the overall Festival Champion . Teams from Northern Ireland, Scotland, Wales and England were ready to give the best performance to win the coveted Howard de Walden Trophy. I was asked to be official photographer for the event. The festival would be over two days with the presentation of the trophy at the end of the festival. 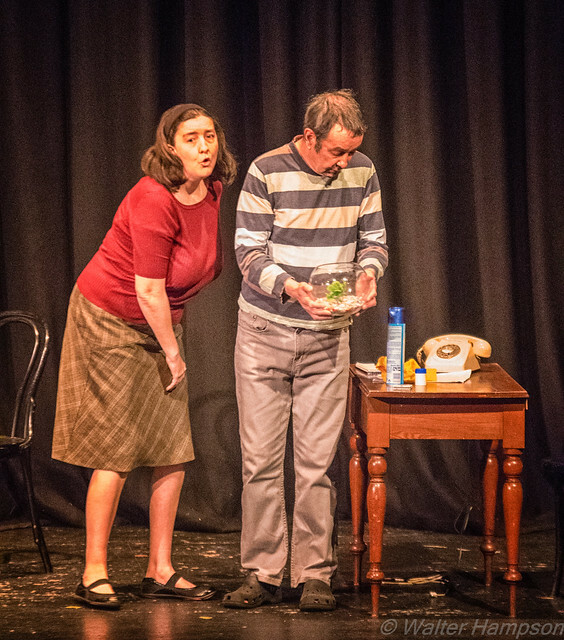 Bangor Drama Club opened the 84th 1 Act British Final on 7th July 2017 with Geraldine Aron’s “Galway Girl”. Two actors portray marriage between two different classes through the years using a small set. Set in a run- down hotel. Lisa whose marriage to Paul was breaking down over their inability to have children had arranged to meet Mark, her brother in law with a view to getting her pregnant. 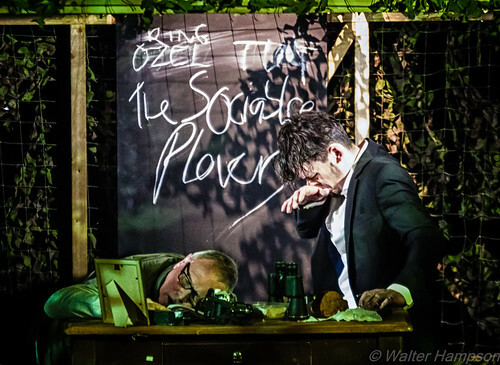 The completion of the Aberfeldy play signalled the end of the competition for that night. Civic Reception: Belfast City Hall. Saturday saw the clubs and representatives of the 4 nations at a Civic Reception hosted by Belfast City Council. The guest of Honour was Dame Mary Peters CH, DBE and a former Lord Lieutenant of the City of Belfast. 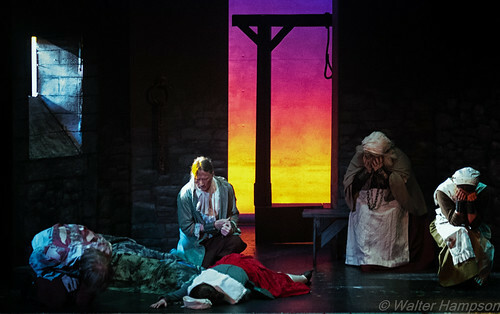 Total Arts Community Theatre presented Lear’s Daughters by Elaine Feinstein & the Women’s Theatre Workshop opened the second night of the festival. Categories: 1-Act, British Final, Lightroom, Photo-Journey, Photography, SCDA, Stage Shots | Tags: 1-Act, Aberfeldy Drama Club, AmDrama. 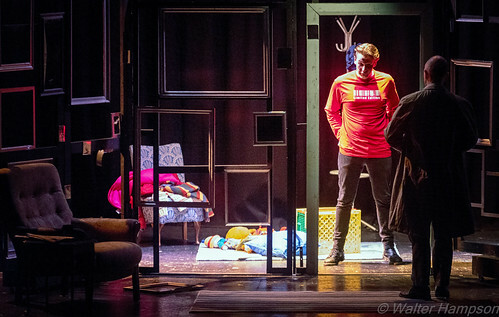 Stage, Bangor Drama Club, Mary Peters, Pentax K-1, Pictures by Walter, Sigma 150-500 Zoom, TACTs, Unknown Outcasts, Walker Ewart, Walter Hampson | Permalink. SCDA – Scottish Community Drama Association more commonly called, SCDA or Scottish Community Drama hold an annual Youth Drama Festival (1-Act Plays) and an Open Festival. In both festivals clubs enter at district level and winners go onto Divisional level. Winners from Divisional finals go to the Scottish final. Youth teams festival finishes with the Scottish Final. 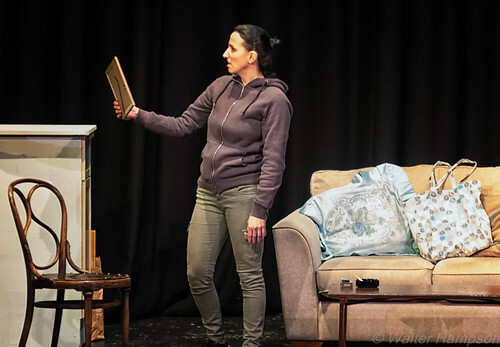 My involvement is minimal – I take pictures and find the challenge in getting a production shot which shows the actors portrayal of character and not a posed shot and taking into account the stage lighting. This year the Scottish Youth Final was held at Birnam Arts Centre in Dunkeld and organised by SCDA Northern Division on 17th June 2017. (1) Kirkintilloch Players 2017 Scottish Champions SCDA Youth Festival. Categories: 1-Act, Lightroom, Photo-Journey, Photography, SCDA, Scotland, Stage Shots, TrainTrips, Youth Festival | Tags: 1-Act, AmDrama. 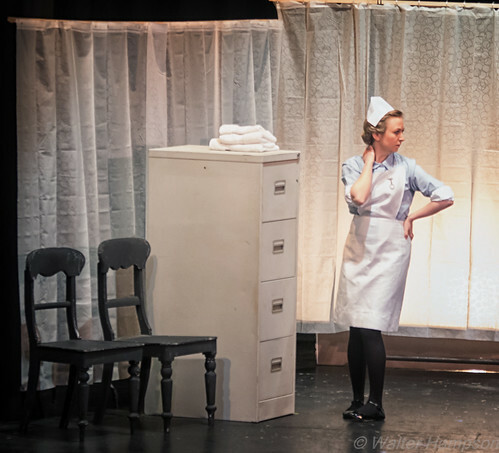 Stage, Indelible Arts Theatre, Kirkintilloch Players, Pictures by Walter, SCDA, Scottish Community Drama, Thurso Players, Unmasqued Drama Company, Walter Hampson | Permalink.